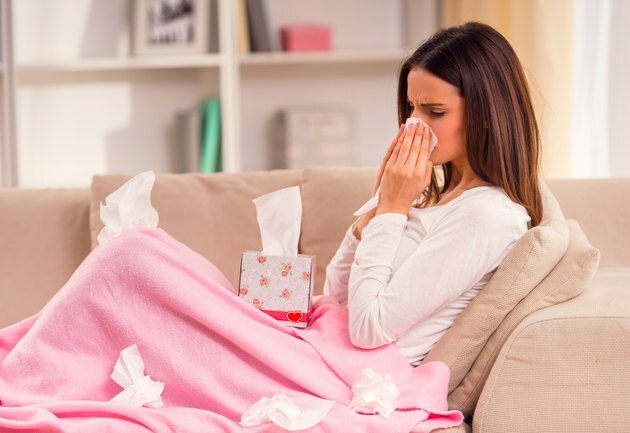 Pregnant women often have enough discomfort at is it, so having to deal with a bad cold or allergies can send many pregnant women rushing to find relief. The U.S. Food and Drug Administration classifies medications for use during pregnancy in order to provide some indication about the relative safety of a particular drug. However, little conclusive research has been done on the study of medications during pregnancy, warns the FDA Consumer Magazine in the article "Pregnancy and the Drug Dilemma," so pregnant women should understand potential risks before taking any medication. Cetirizine, also referred to as its brand name Zyrtec, is a prescription antihistamine that is classified as a category B medication. This means it is not expected to be harmful to an unborn baby, according to Drugs.com. It is generally less sedating than older antihistamines and therefore may be a good option for pregnant women, according to DrSpock.com. Drugs.com indicates that possible side effects of cetirizine include dizziness, dry mouth, sore throat, cough, nausea, constipation and headaches. Chlorpheniramine is a prescription medication sold under a wide variety of brand names. It is classified as a category B. Common side effects include sleepiness and dry mouth, mild dizziness, blurred vision, nausea, stomach pain, constipation and memory or concentration problems. Fexofenadine, which is sold under the brand name Allegra, and is only available by prescription. This medication is a category C medication, which means it is unknown if the medication poses any risks to the fetus. Because of this, it may be better to select a different antihistamine to use while pregnant. Common side effects include nausea, diarrhea, upset stomach, menstrual-like crampring, drowsiness, headache and muscle or back aches, according to Drugs.com. Loratadine is a antihistamine that may be available both over-the-counter and through a prescription. It is often sold under the brand name Claritin. This medication is not believed to be dangerous for pregnant women, and is a category B medication. Although drowsiness is a potential side effect, loratadine generally causes less drowsiness than other medications, explains the popular parenting website DrSpock.com. Drowsiness, dry mouth, blurred vision, headaches, nervousness, stomach pain, diarrhea, redness of the eyes, nosebleeds or skin rashes are potential side effects of loratadine, according to Drugs.com. Diphenhydramine, often sold under the brand name Benadryl, is available over-the-counter at many drugstores and supermarkets. This medication is classified as a category B. Common side effects can include sleepiness, fatigue, headaches, dizziness, dry mouth, an enlarged prostate or difficulty urinating, according to Drugs.com.